Dimensions 13.5 In. X 9.0 In. X 20.0 In. I love this backpack for its rugged, well built, sturdiness. I am sure it will last years. It holds all of my carry-on stuff in an organized fashion. My laptop fits nicely and is easy to access. I love the "layered" pockets and heavy duty zippers. One discovery... when loaded maximum, it will not fit under the seat in front of me on the plane. The next time I flew, I left one of the pockets empty and it fit. I still got a lot of stuff in. It is balanced nicely when full. I am an average sized male and find that when I carry, the straps are a bit wide requiring them to be pulled together and secured by the clips mid chest. One of the clips came off recently, but I was able to slip it back on. another challenge is that there are no pockets for water bottles. I solved that by hanging a large carabiner on the handle and use a water bottle with a handle on the lid. The bottle rests nicely in the lower side unzipped pocket or it's not so bad just dangling. Overall, this is a great pack and it serves me well. If you have read the specs on this bag you know it has 4 interior and 7 exterior pockets and that means ease of organization. Recently took this backpack as my only carry on piece on a 3 day trip. Although it is marketed as a laptop bag, don't be fooled into thinking that is all it can do. I was able to pack three complete changes of clothes less pants and shoes, toilet kit, mid weight outer wear jacket, a 1000+ page hard back book and more in the interior compartments with room to spare. The exterior pockets allowed me to organize all that small stuff you need to access when traveling such as charging cord, phone, glasses, snacks, car keys, passport, water bottle, note pad, calculator and even my wallet and money clip when I had to clear TSA. The exterior is 1050 denier nylon, the inside of all compartments are lined, all seams are bound and the zippers are high quality. The straps are padded and mesh lined as is the front of the pack for extra comfort. Total usable space is somewhere around 2000 cubic inches making it not too big. 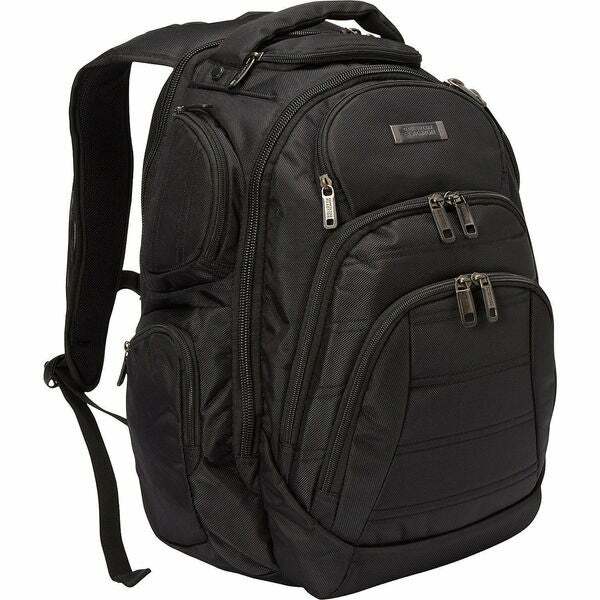 This is a high quality back pack for work or travel and a steal at the current offering price of just over $50. Lots of pockets. Perfect! I wanted this to carry my personal 13 MacBook Pro &amp; HP 17’ work laptop at the same time! I have room for all my accessories for both computers and wallet, notebook and planner. Has a great pocket for sunglasses on top as well 4 side pockets 2 of which expand for water bottles or protein shakers. Highly recommend! This is an attractive, sturdy backpack with lots of compartments. It is also large, so it'll be great for day trips. It will protect my ipad. I also like that it has a zipper on the front of one shoulder strap. It's small, but big enough for keys, Dramamine, etc. I bought this because I was tired of carrying a large tote and the strain it was putting on my shoulder. This backpack sits comfortably and holds everything I need. I haven't had any issues with it. 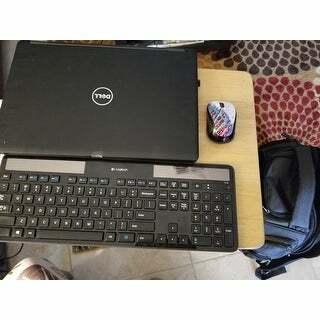 It seems durable and despite holding a laptop and many files, it is relatively lightweight. It just has too many sections. It would have been better designed to have another larger compartment instead of of so many smaller ones. The interior sections are too small to be usueful in one compartment. Tons of pockets. Used it for travel and also as my tactical shooting bag. Nicely padded. Great deal all around. I just got this laptop backpack and used it on a trip and am very happy with it. It is the perfect size and has plenty of zippered compartments. This replaced an over the shoulder computer bag/ briefcase and exceeded my expectations. I have already suggested another traveler visit overstock.com to buy one. I love all the pockets. It makes organizing so much easier. 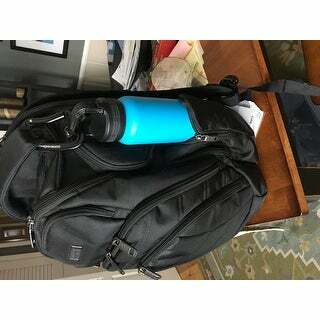 It's also got a nice, large main compartment that's big enough for my lunch and 32oz thermos. Bought for my husband. He absolutely loves it. Space, convenience, weight distribution and the quality of workmanship. I would definitely recommend this product!! To be honest, I haven't used this much. I like the design and think it would be ideal for work, school or even a weekend trip. I got it to take on trips and so far have not had the opportunity to do so. I would recommend it for school/work but not sure about trips. I love this computer bookbag. 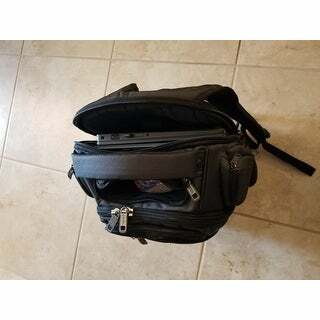 It's roomy, has more than enough compartments/pockets for supplies, necessities and for my 17" Dell Laptop, wireless Logitech keyboard and my wireless mouse, plus books and notebooks. And with all that, some how its constructed to distribute the weight because it doesn't feel that heavy and quite comfortable. See pix of how much room after storing equipment. 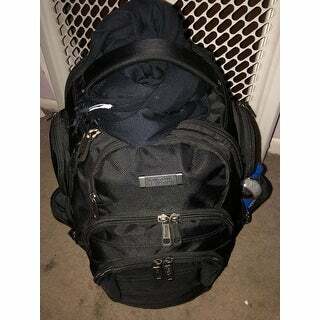 This pack pack is good quality, I bought it for a month long trip to Europe. The pockets allowed me to stay organized. The pack pack itself is a little heavy though. So beware that it might bog you down once you have it packed full! Well made with lots of places to put things. I highly recommend this backpack. Got this for my college aged son. He uses it daily and loves it. It's very sturdy and hold his books, laptop and other devices well. There are lots of pockets/spaces for storage. I'm hoping for the best. My husband wears out backpacks regularly by stuffing them way too full. This one seems huge enough that he may not be able to rip out the zippers. When he put his work things and computer in, there was room to spare! Good bag for the price. Nice day trip bag with ample space. Came fast and is as described. Quality seems good. Heavy duty zippers will last too. I would recommend this to a friend. It is a gift but I think it will work perfect. "There is no indication as to which color the charcoal or pin dot charcoal colors are. When you click on your choice of color, it should change the picture to the correct color, but it stays on the black color. Which one is the color that looks more grey/silver - is it the Charcoal, or Pin Dot Charcoal?" I had that issue too. I ordered the Pin Dot color and it's the lighter pewter grey. Looks really good. Does have a little sheen to it but not overboard. I chose the one that said "black" because that was the color that I wanted and was available as a choice. "What color is the dark charcoal - "pin dot" or regular?" 5708140 is an assortment of multiple colors. The items that are set up are 5708145 (black), 5708148 (charcoal), and 5708148P (pindot). my son loves this backpack. he had one that lasted 2 years. 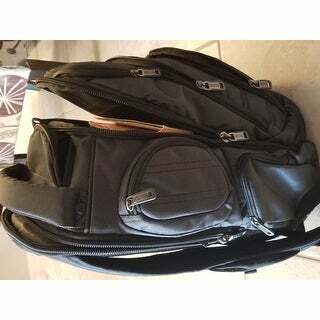 Because Kenneth Cole product is very good and everlasting so that is why i love it and choose it.